When it comes to the aviation industry, new technologies and manufacturing techniques have been mounting a silent revolution in the latest generation of commercial twin-aisle aircraft: the Boeing 787 Dreamliner and Airbus A350. Both these aircraft contain around 50% of CFRP composites, as opposed to their previous iterations where aluminium alloys had dominated. This explains why, when Boeing and Airbus introduced these two crafts several years ago, most experts thought that the next generation of planes would be made out of composites, a trend that would then expand to include smaller jets – but as turns out, they were wrong. Boeing’s latest 777-9 will have composite wings but will sport a mostly aluminium fuselage The reason for this change is the emergence of advanced third generation aluminium-lithium (Al-Li) alloys, which are not just cheaper than both CFRP and titanium alloys, but are also lighter and stronger than previous iterations. As a result, Al-Li alloy-intensive aircraft have better fuel efficiency and lower maintenance costs. Al-Li alloys are particularly suitable to any application where the strength-to-weight ratio is critical and fatigue cracking is a concern. 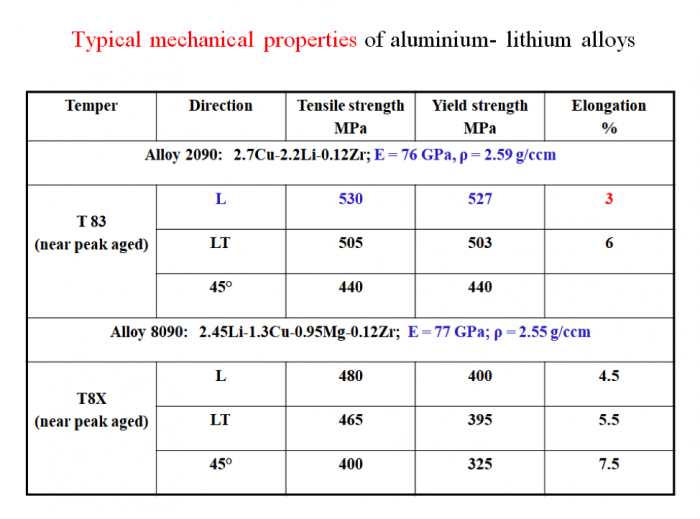 Commercial Al-Li alloys usually contain 2-3% of their weight in lithium, along with copper and magnesium alloying elements. Lithium reduces density (it is the lightest known metallic element) while increasing the material’s elastic modulus when alloyed with aluminium. With proper alloy composition, Al-Li alloys boast exceptional combinations of strength and toughness. Resistance to fatigue cracking is also generally superior compared to standard 2xxx and 7xxx series aluminium alloys. The latest generation of aluminium lithium alloys also have improved corrosion resistance and greater toughness than their predecessors. Some latest Al-Li alloys include Arconic’s AA 2099. Compared to alloys 7075 and 7050, AA 2099 offers similar strength, reduced fatigue crack growth, improved corrosion resistance with a 6 to 7% lower density. Alloy AA 2099 plate is available in the high strength T86 temper and is generally used in the Boeing 787 Dreamliner, among others. The AA 2198 Al-Li alloy, the most advanced third generation alloy commercially available today, was chosen by Airbus for the fuselage skin sheet material of the A350. Al-Li 2198 in T8X temper condition shows an outstanding combination of high static strength and high damage tolerance for large damage capability like two frame bay crack. 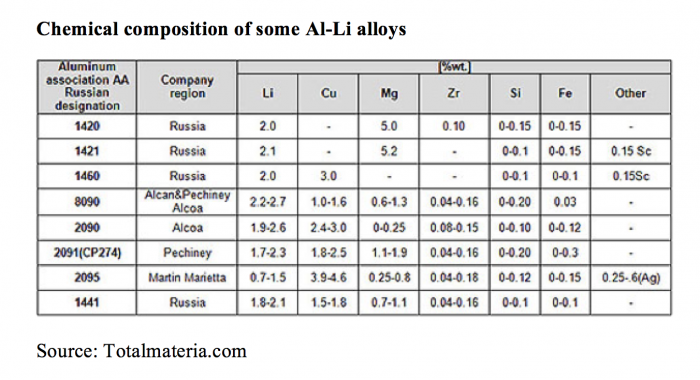 Other recent Al-Li alloys include AA 2050, 2060 and 2065. Besides these registered alloys, other commercial Al-Li alloys include Weldalite 049 and CP276. 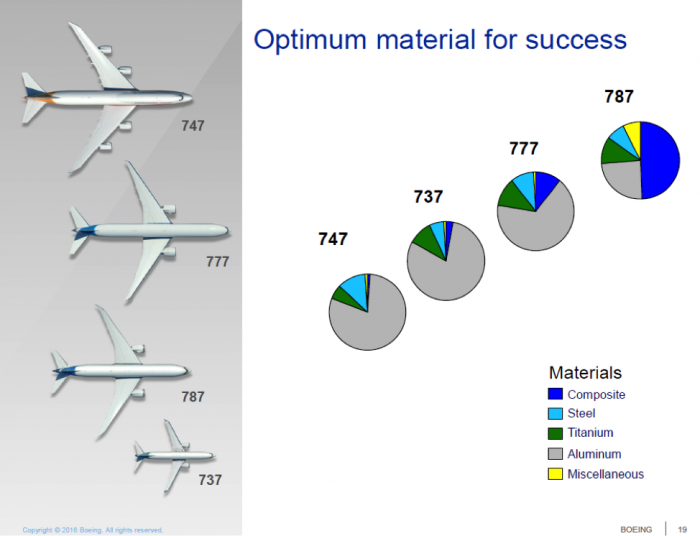 Aside of these advantages, the main reason aircraft makers are turning back to aluminium alloys by is cost reduction, especially since the 787 Dreamliner is being built by Boeing at a loss. In a bid to lower costs, the company has changed the cockpit window frame on the 787 to aluminium from titanium, and has changed the frames of some doors to composite from titanium. As part of its cost-reduction effort, industry sources say that Boeing is also considering switching to less costly aluminium for seat tracks on the 787. 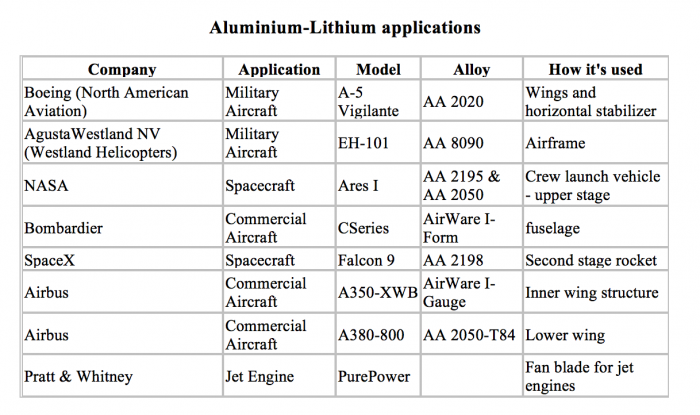 But it’s not just Airbus and Boeing who have embraced Al-Li alloys. Bombardier Business Aircraft is now using it for the fuselages of its new Global 7000, as well as its Global 8000 sibling. The material has shown the ability to reduce weight by as much as 10 % versus composites on single-aisle transport aircraft. This could result in up to a 20 % gain in fuel efficiency. In the expectation of strong demand, Alcoa (now Arconic) invested US$ 90 million in the world’s largest Al-Li production plant in Lafayette, Indiana, where it produces over 20,000 tonnes (44 million pounds) al Al-Li alloys annually. The Lafayette facility is also capable of making the world’s largest aluminium-lithium ingots, approximately 50 % larger than the nearest competitor, and big enough to make any single-piece component on today’s aircraft. Single-piece parts make structures stronger, lighter and less expensive because they minimize the number of complex joints. Before the split, Alcoa also expanded another Al-Li facility, located in Upper Burrell, Pennsylvania. The upgrades were made in expectation that the new Boeing’s 777-9 model will be increasingly using Al-Li alloys. Constellium recently opened a new Al-Li foundry in Issoire, France, the latest effort to meet demand in aircraft construction. Dedicated to a new line of alloys dubbed Airware, the new casthouse has the capacity to produce 14,000 tonnes of Al-Li alloys per year. Airbus buys some 75 to 80 tonnes of Airware for every A350 aircraft. Its content of Al-Li alloys is 19%, 53% composites and 14% of titanium alloys. Aleris also invested heavily in new Al-Li production facilities in Germany and China in recent years. The Zhenjiang plant in China saw investments of some US$ 350 million as a result. All major aluminium processors, with advanced rolling and casting technologies, have signed multi-year contracts during the last several years to supply major aircraft manufactures with latest generation of Al-Li alloys. Last November, Arconic signed a multi-year contract with Airbus worth almost US$ 1 billion to supply aluminium sheet and plate for multiple commercial aircraft programmes. In 2014, then Alcoa, signed US$1 billion contract to supply sheet and plate products to Boeing for commercial airplanes. That same year, Alcoa signed a separate, US$1.1 billion, 10-year contract with jet engine maker Pratt & Whitney to provide components, including fan blades using Al-Li alloys. In March 2016, Constellium signed a multi-year contract with Airbus. Constellium will supply Airbus with a broad range of advanced aluminium rolled products for airframes including wing skin panels, aero-sheets for fuselage panels, as well as rectangular and pre-machined plates for structural components. Starting from this year, Aleris will supply plate and sheet for Airbus, including the latest Al-Li alloys for wing skins. Chinese company Nanshan Aluminium will supply aluminium plate to Boeing, paving the way for other Chinese companies to enter global aerospace aluminium market. China’s new Comac C919 commercial aircraft will use 8.8% of Al-Li alloys and 12% of advanced composite materials. Austrian company AMAG Austia Metall AG and Romania’s Alro have also signed last year long term contracts with Airbus. The two companies will supply aerospace certified aluminium flat rolled products to Airbus mainly for the use in the aircraft structure and skin of all aircraft families. “The future of aviation is being built with aluminium-lithium”, said Klaus Kleinfeld, last chairman and chief executive of Alcoa (before the split). 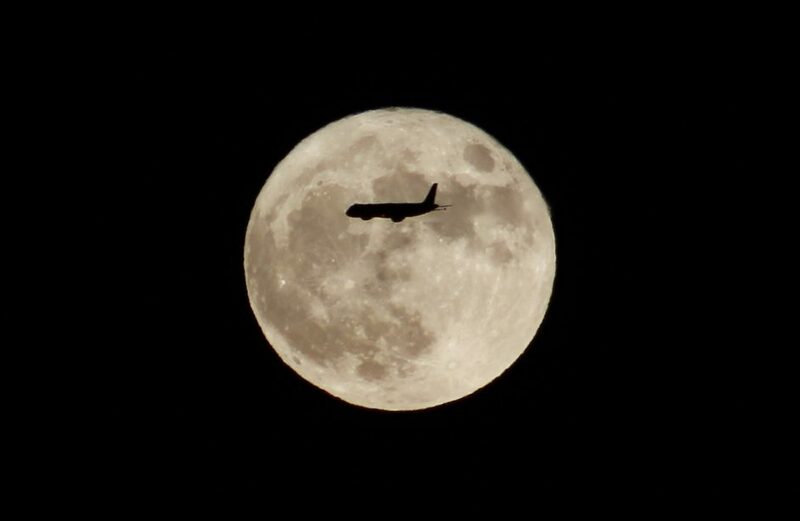 And according to a forecast completed by Flight Ascend Consultancy, part of FlightGlobal, he might be right. 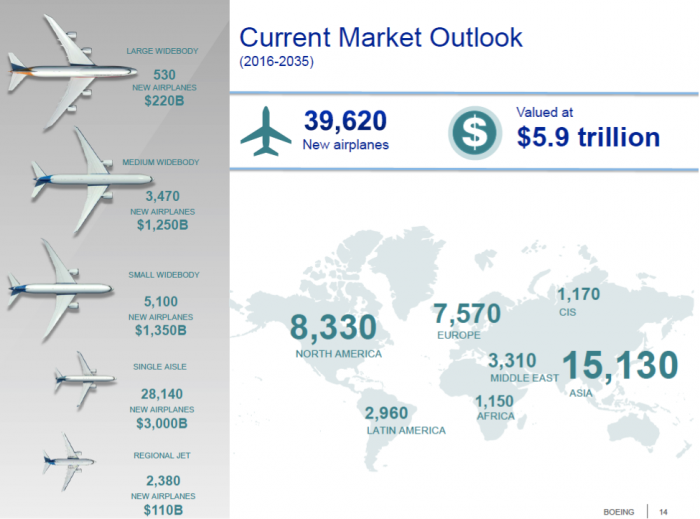 The world’s fleet of commercial aircraft is expected to increase by 81 % and will reach 49,940 aircraft in 2035. Continued higher-than-average passenger traffic growth rates in the Asia Pacific region will be the key driver for the industry’s growth and aircraft demand for the next 20 years. Finally, tomorrow’s alloys are already being devised. Aleris has co-developed with Airbus an aluminium-magnesium-scandium (AlMgSc) alloy – designated AA5028 – that offers an even lower density than Al-Li alloys. In the ongoing battle between composites and aluminium, it looks like aluminium alloys are on track to landing the decisive blow. 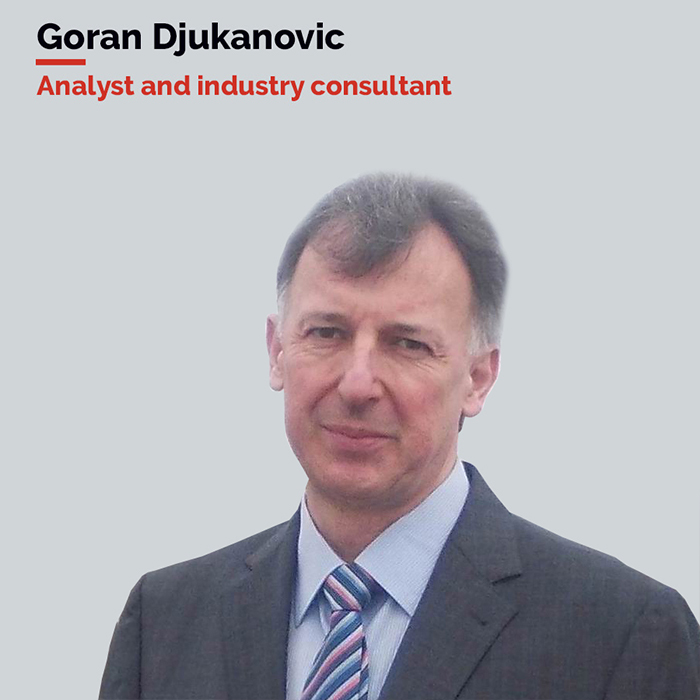 Goran Djukanovic will be a speaker on Aluminium vs. steel in automobiles at the 4th Danieli Innovaction Meeting in October, in Buttrio, Italy.